Ikura especially coho salmon roe preserved in salt or soy sauce is caviar like side dish that is commonly used in sushi and as a topping for cooked rice. It is easy to confuse with sujiko, which uses coho salmon roe but due to the fact that it is preserved in soy sauce, it is called sujiko. 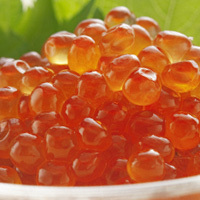 Ikura is best stored frozen to preserve for long periods of time. The calories in Ikura per 60g(1 portion) is 163 calories. Ikura is calculated to be 272Cal per 100 grams making 80Cal equivalent to 29.41g with 19.56g of mostly protein、9.36g of fat、0.12g of carbohydrates in 60g while being rich in vitamins and minerals such as Vitamin B12 and Vitamin D.